Established in 1993, the Kliss's hot glass studio, Kliszewski Glass, is located in sunny Central California. Both Bob and Laurie studied at Pilchuck Glass School. They take pleasure in each handmade piece they create and strive to enrich the lives of art lovers everywhere. To begin each piece, the artists assemble the colors and shapes for the base, and fuse the base with secondary color elements. Next, they blow the vessel, continually heating and re-heating the piece up to temperatures of 1000 degrees. They melt and fuse the glass, working with it until it reaches its final desired shape. Then, they apply the brightly colored lip wrap to the vessel's rim, which completes the piece. After cooling, each piece is signed and dated. Steve melts clear and colored tubes and rods in a gas-oxygen flame that reaches up to 4600 degrees to shape the glass. 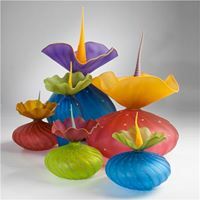 The shapes are realized by blowing, stretching, adding and removing glass. Different colors are melted together, gradually building the shape as desired. No molds are used to form the glass. Steve was introduced to glass in 1969 by Cap Duewer, a scientific glass blower. Cap and his son David taught Steve how to color glass using chemicals and instilled an ethic for doing quality work. Other glass includes Asta Glass, Bibelot, Exotic Sands, Fire and Light Glass, Glass Eye Studio, Glassworks Northwest, Henrietta Glass, On Reflection, Nina Cambron, Nikolas Weinstein, Ran La Roca, Kittelson Kaleidoscopes, Thorn Ridge, Ultimate Reflections, WGK Glass and many more.